OmegaPlex is a broad-spectrum essential fatty acid supplement, providing special fatty acids from both the omega-3 (EPA/DHA) and omega-6 (GLA) families in easy-to-swallow capsules. In addition to the separate benefits of flax, borage, and fish oils, combinations of these have been shown to favorably benefit the immune system and bone density; future research promises to explore additional synergistic effects. 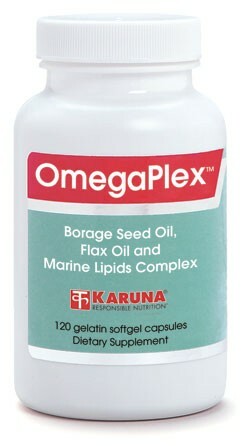 Given the evidence that Americans seldom obtain sufficient amounts of these essential fatty acids, OmegaPlex is a valuable adjunct to many supportive nutrition interventions. Borage seed oil, in combination with fish oil, favorably influences the immune system through effects on interleukins and other cytokines (Biochem Soc Trans 1997;25:343S). Combined sources of GLA and EPA/DHA are helpful adjuncts to a nutritional program to help maintain normal bone density (Aging (Milano) 1998;10:385-94). 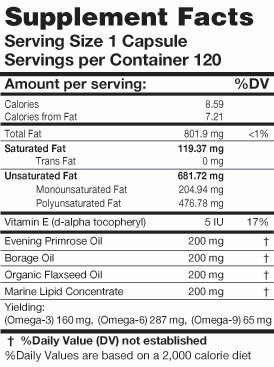 essential fatty acids 40 The statements herein have not been evaluated by the FDA. These products are not intended to diagnose, treat, cure, or prevent any disease. Suggested use for adults: 2-4 capsules daily, taken with meals, or as directed.